Can Ramen Get Even More Kitschy? Gotta love this graphic for this great show! The funny green squiggly thing in the nose moves at the beginning of each episode. When we first moved last summer I found myself without a tv for a few weeks. I read lots of books and spent a bit, ok, a lot of time on my ipad watching Netflix. I discovered this great show, The Mind of a Chef, narrated by Anthony Bourdain. It features renowned, interesting chefs who are doing new takes on traditional foods in their restaurants. The first few episodes are about a guy named David Chang and the very first episode is entitled Noodle. Full disclosure now... I secretly love noodles - any noodles, but you will not even find one piece of old spaghetti in my pantry because I just don't ever need those kind of carbs unless I'm eating out for something special. However, I defy anyone to watch David Chang travel through Japan and China slurping ramen and other noodles and not develop a hankering for some. Seriously. The problem is that it all looks like something you could make yourself with a little ingenuity. 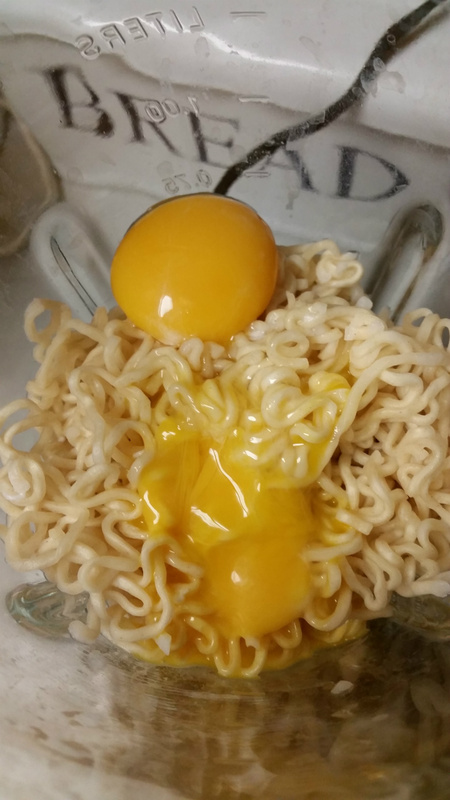 Of course I went to the store and stocked up on miso, green onions, boiled eggs, pork, various veggies, ramen and tried to make a version of what I was seeing him eat. I didn't use the seaweed or fish sauce or those other authentic things they put in the broth because I don't like them. I also began looking up ramen restaurants in the area and discovered several. Haven't been to any of them yet but I'll let you know when I do. I'm not going to go into the history of ramen, but I highly recommend that you watch the show. Anthony Bourdain does a great job narrating and the chefs are all very interesting and passionate and relatable. 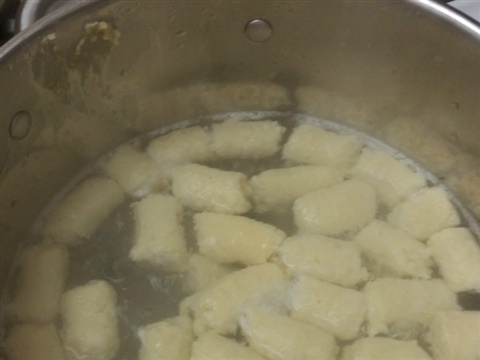 One of the things that David Chang does with ramen noodles is to repurpose them to make other things, such as gnocchi. 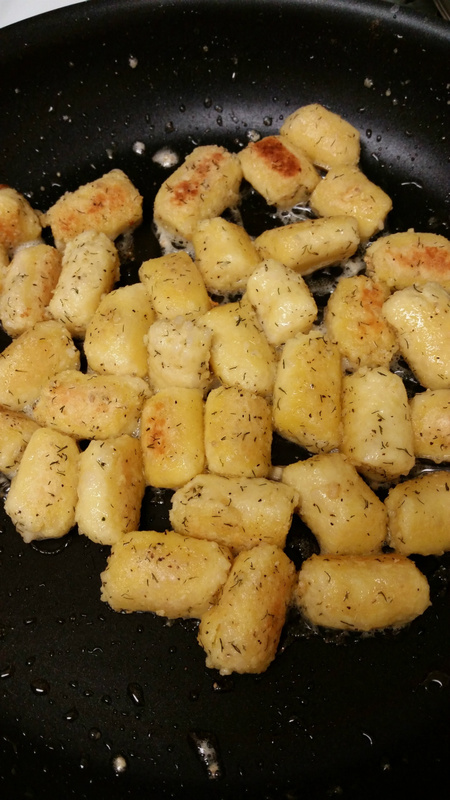 Gnocchi is usually made with potato dough. David Chang apologizes to the Italian cooking gods for this recipe, but he unabashedly goes ahead and shows how to make it using ramen. I love gnocchi and spaetzle. And ramen. When I saw him make this, I knew I had to try it. I have made it three times. The first time I did it from memory and the end result was edible but too soft. 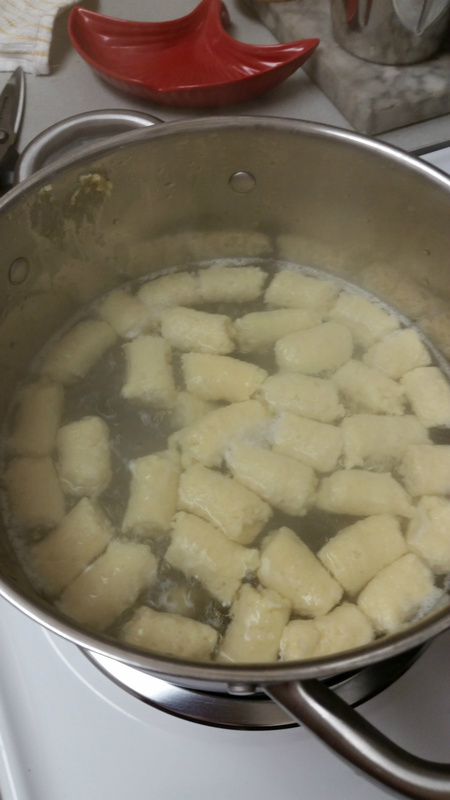 The second time I watched the noodle episode and for some reason didn't use as many egg yolks as he did and when I went to cook the gnocchi it just dissolved in the water. I encourage you to try this. It is fun. It is a little crazy. Above all, it is kitschy! 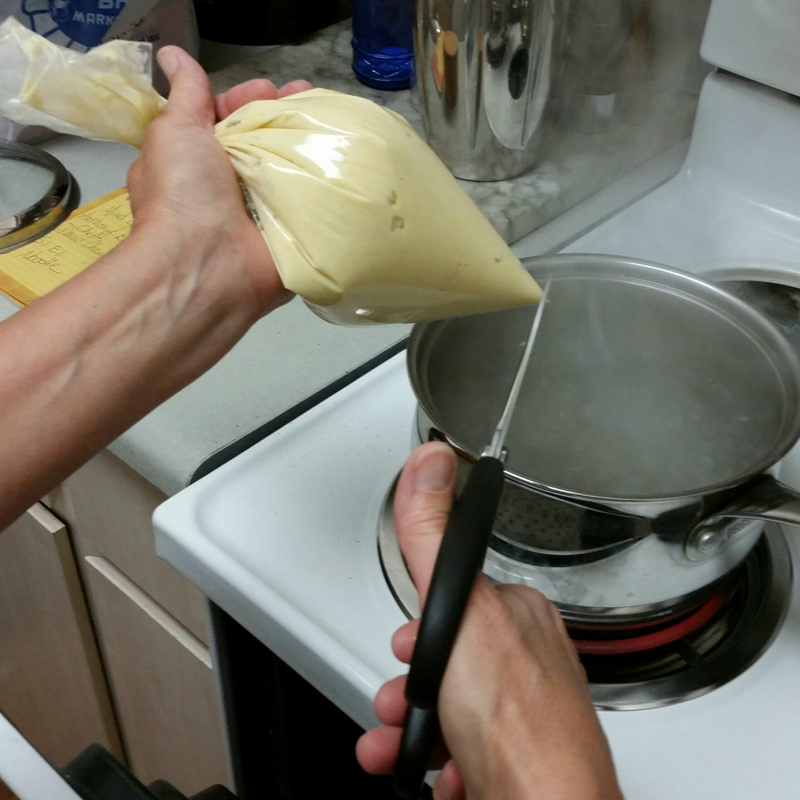 Put milk in a suacepan and heat on medium. Do not boil. Place the noodles in the hot milk and allow them to soak up the liquid. Soak them until they are soft and al dente but not really cooked. Remove the noodles from the milk and put them into the food processor. Save the milk to use if you need some to soften the dough. Process the noodles to chop them up and then add 4 egg yolks and continue to process until you have a thick mixed dough - kind of like cookie dough. 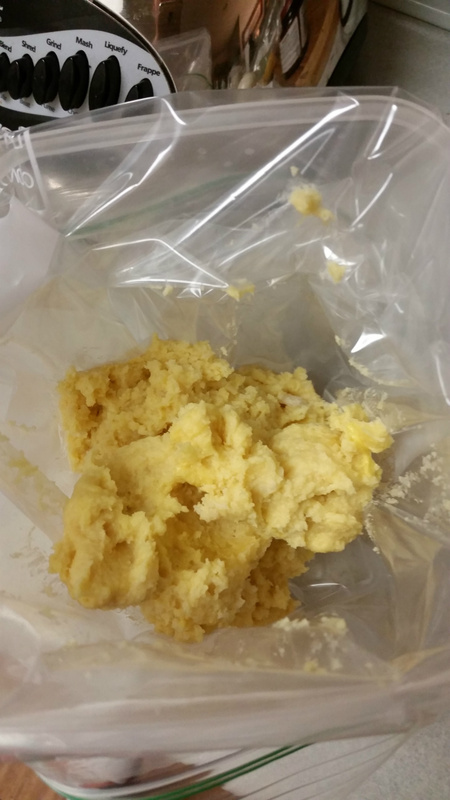 If you need to add a teaspoon or two of milk to help it mix go ahead, but the dough has to be thick or it will disintegrate when you try to cook it. 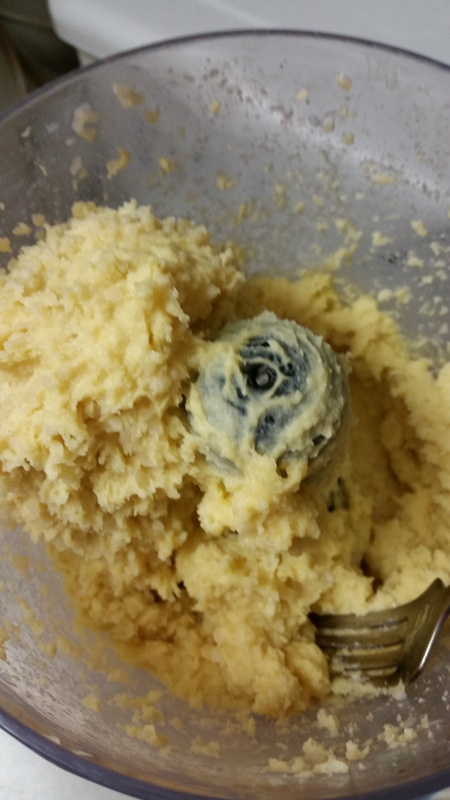 The dough needs to be the consistency of cookie dough. I used a gallon baggy as a pastry bag. Snip the end of the bag to extrude 1/2" dough. 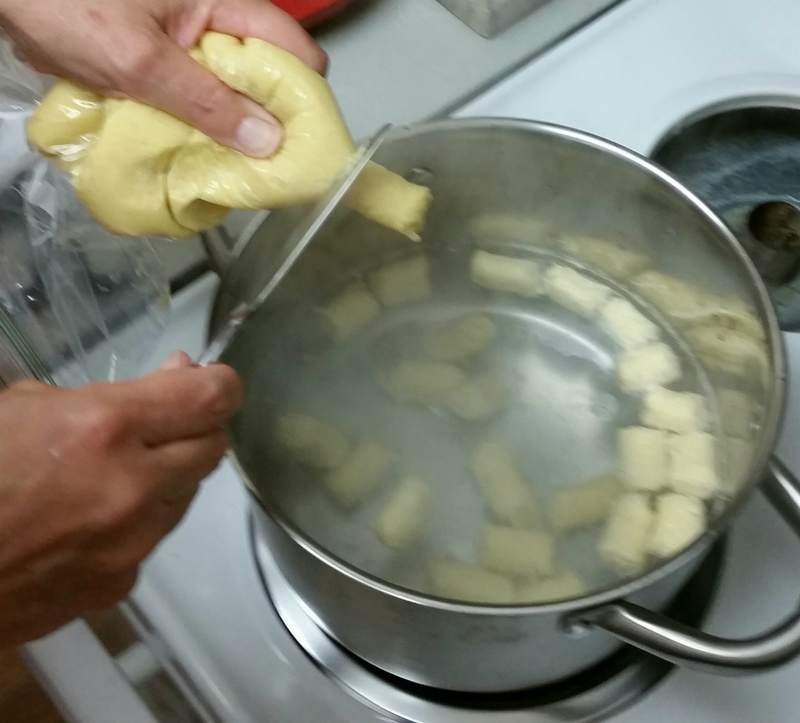 Squeeze and cut off dough into boiling water. 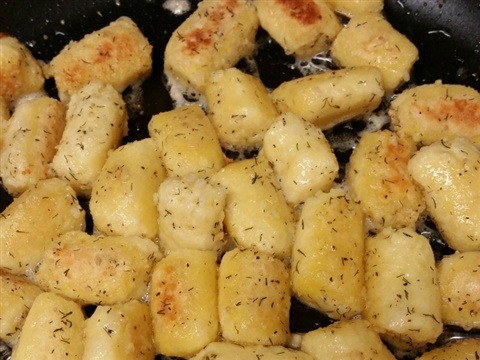 The gnocchi does not need to cook any longer than it takes to extrude all of the dough. The water does not need to be at a rolling boil. You don't want to burn yourself! Drain the pasta and brown it in butter. Treat it gently! David Chang added fresh lemon juice and topped it with parmesan cheese. 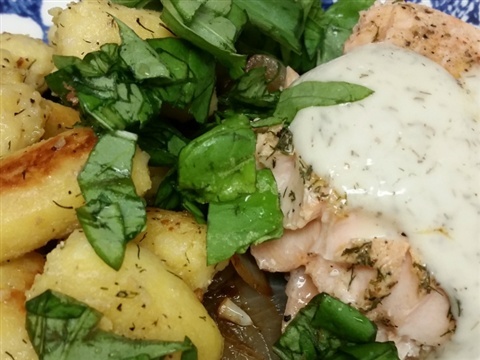 He also added fresh chives and thyme. 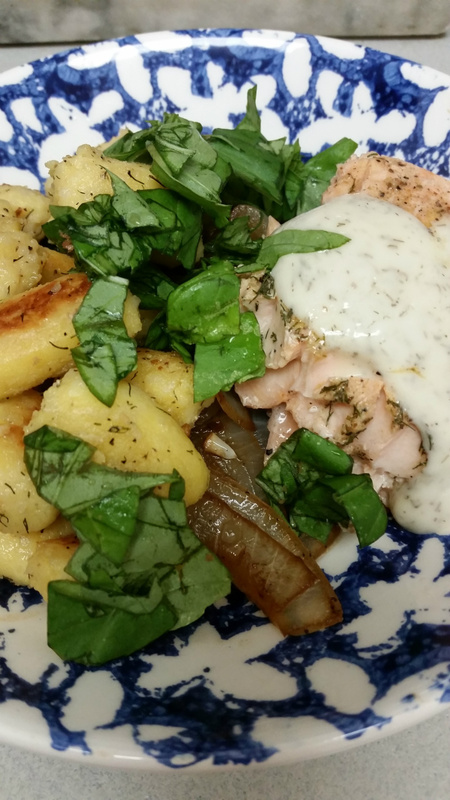 I served my gnocchi with carmelized onions, spinach, salmon and fresh basil.